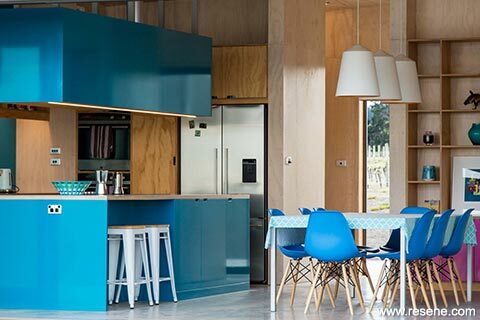 It takes a skilled design hand and an adventurous client to include a provocative cerulean blue kitchen into a house, especially when the rest of the home has a predominantly natural look with extensive use of pine plywood and concrete floors. Add some built-in sideboards in vivacious fuchsia pink, and the scenario gets even more interesting. The house was designed by Wellington-based Bonnifait + Geisen and sits within a Hawkes Bay vineyard with distant sea views. A simple palette of raw materials is used both on the exterior and the interior, combined with punches of vivid colours on the furniture and the pine plywood which is finished in Resene Colorwood Whitewash. The kitchen’s strong linear aesthetic counterbalances the strength of the colour: the cabinets have no protruding handles, a simple open shelf extends across the back wall and the overhead cupboards above the island bench are suspended on robust steel rods. The benchtop is stainless steel on a plywood substrate. This striking kitchen, day and night, is finished in Resene Allports and the side cabinets are in Resene Smitten. 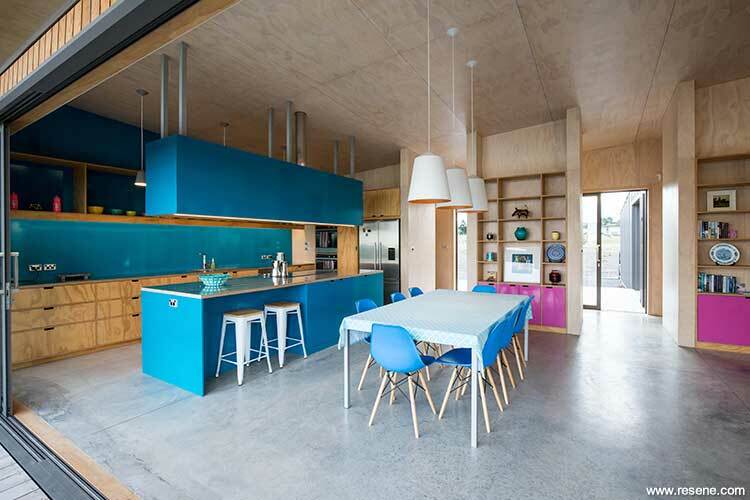 The strong colour is offset by plywood walls and a raked ceiling finished with Resene Colorwood Whitewash. The living area works on a combination of calm and subtle whitewashed plywood, enlivened by the eyecatching blue kitchen and pink sideboard cabinets, using Resene Allports and Resene Smitten. Using these already powerful colours with a Resene high-gloss finish (including on the splashback) makes the scheme even more daring and punchy. All of the interior doors are also finished with Resene Smitten, creating pink tinged zones as you move around the house with the direct sunlight on the colour illuminating the circulation spaces in an alluring wash of reflected colour. The floor is protected with Resene Concrete Wax. 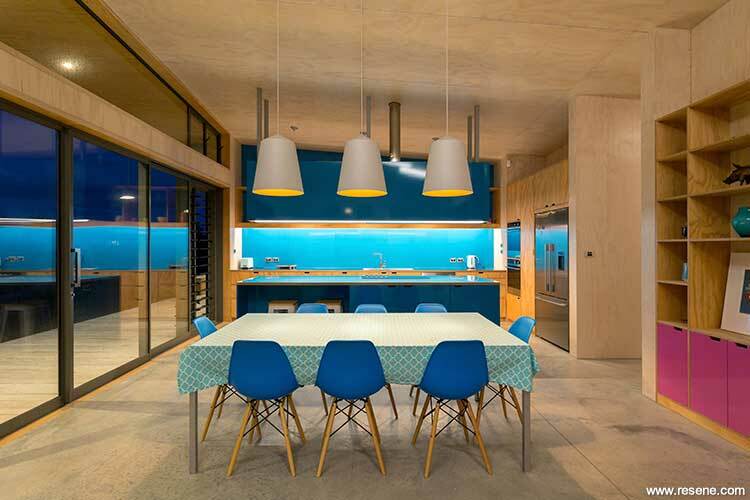 Did you know: That Resene has many products to bring out the beauty of natural materials including Resene Colorwood timber stains and clear concrete finishes? Ask the staff at your local Resene ColorShop to help you choose the right one.